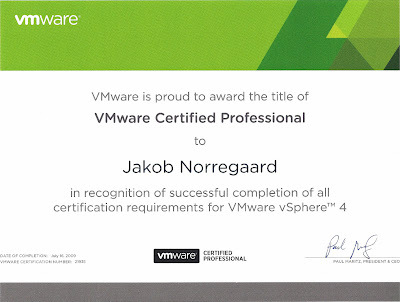 Today, the official VCP4 certification arrived in the mail. Six months(!) did it take for VMware to send the papers. There's no visible sign on the certification to indicate that it was taken as part of the beta exam - except for the date in the lower left corner (July, 16th 2009) indicating that it was achieved before the official release in August 2009. As a bonus, a free license for Workstation 7 was included in the package which is pretty cool.